In case you haven’t heard, our house is one of the most unique ones on the block. Not so much because of a wild paint color or because of standout landscaping (although I’m pretty biased towards our super cool mid-century silhouette), but because our house numbers make absolutely no sense for the area. I’ve already shared the story in this quick post about our wall-mounted mailbox makeover, but we are still experiencing problems with people (namely UPS and FedEx drivers) not being able to find our house. So we took things just one step further with a DIY combination house numbers planter that we plopped right at the entry of our driveway for easy identification. Read on to learn how you can craft your own in just one afternoon using a few hardware store basics and simple tools. The added bonus? 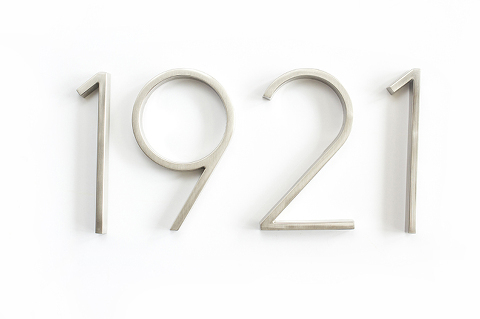 It makes for a super sentimental and practical housewarming gift, too! 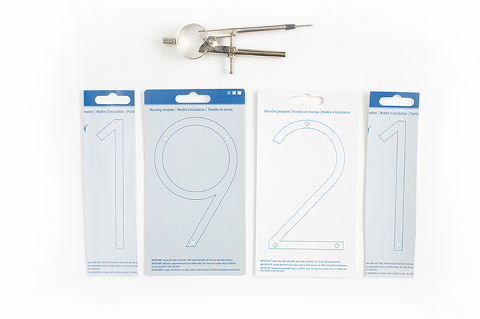 Start by using a sharp awl tool or the pointed end of a compass to punch small holes into the paper house number templates where noted. Then, tear off small pieces of painter’s tape, and attach the tape to the tops and bottoms of each of the paper templates. Arrange them evenly on the side of the plastic planter, and tape them in place. You may want to use a ruler and level to get thing all super accurate, or just eye-ball the arrangement—that’s what I did. TIP: If you place one large piece of painter’s tape across all of the numbers once you have them level, you can move everything as one in order to center it on the planter! 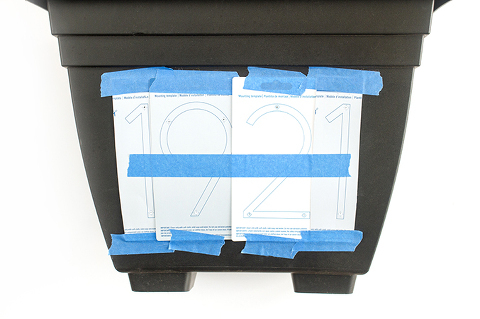 Stick a 5/64″ bit (or whichever type of bit is needed for the hardware that comes with your set of house numbers) into a power drill, and drill directly through the punched holes in the paper templates to make holes in the side of the plastic planter. Remove and set aside the paper templates. I ended up keeping my templates on hand in a folder just in case I change my mind in a couple of years and want to rearrange them on a different surface. Next, push the hardware that came with your house numbers through the drilled holes from inside the planter so that the threaded sections stick out. Screw the metal house numbers onto the protruding hardware on the side of the planter. Tighten from inside the flower pot using a wrench. Note that, for floating mount house numbers, the hardware may stick out inside the planter a bit. This will not make any difference to the look of the planter because, happily, those will be covered with dirt in the next step. Fill the completed planter with potting mix, and then plant your favorite season-appropriate flowers so that they are visible from the top of the planter. I picked up a clearance pot of mums for less than $2 and a couple of pansies to give our retro-inspired, retrofitted planter some fun color. 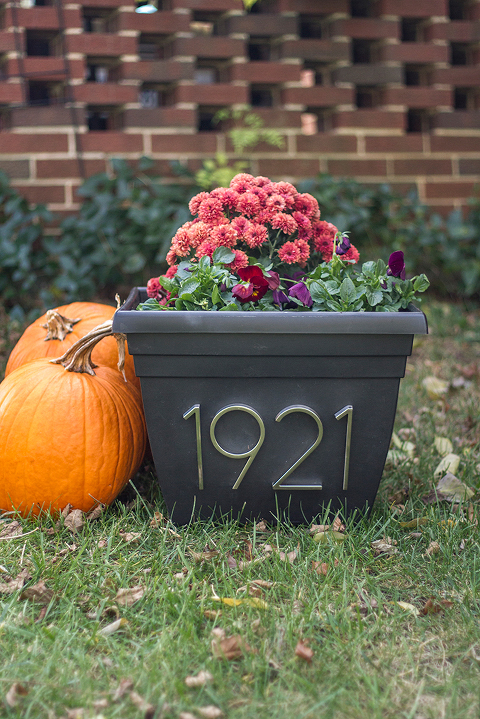 Finally, situate your newly-created combination house numbers planter at the foot of the driveway or right outside your home’s entry so that it is in clear view from the street for viewers and passersby to enjoy. Fingers crossed that I’ll be getting shipments on time from now on since, hello! Christmas shopping season! You know that I’ll keep you posted.